With performances of To Catch A Fish heading in to their final weeks, we wanted to take some time to talk to the actors and give them a chance to share about their experience with the show. 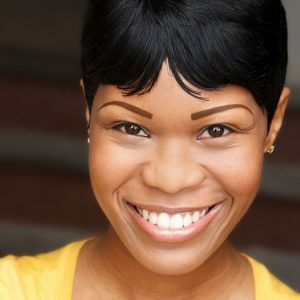 So we’ll be releasing features on some of the cast members as they share about themselves and what makes this play an important part of Chicago’s summer theatre scene. To Catch A Fish is inspired by the story of Chauncey Wright, a man suffering from brain damage who was tricked into illegal activity by federal agents. In 2012, agents of the U.S. Bureau of Alcohol, Tobacco, Firearms, and Explosives (ATF)—the agency responsible for enforcing gun laws—began “Operation Fearless.” At its face, the operation was a general wares store in a low-income area of Milwaukee, Wisconsin. Under the surface, however, it was a front to coerce people into illegally selling guns to federal agents, who would in turn arrest and prosecute them on federal grounds. Wright handed out fliers for the store and was eventually manipulated into selling guns to the agents. He was then arrested for doing just that. 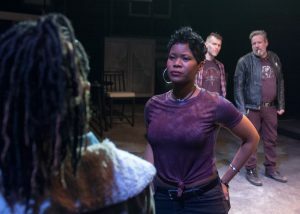 In performing To Catch A Fish, AnJi loves the intimacy that TimeLine’s theatre space provides: “[it] allows [the actor] to have more subtlety in emotions and actions humanizing the characters, making the experience for the audience real.” During the tech process, she experienced some scenes as an audience member and was amazed at the show’s climax. “I cringed in my seat, found myself turning away, or wanting to get up and leave and even had the impulse of yelling STOP!” she shared. To Catch A Fish is now playing at TimeLine Theatre through July 1, 2018. For tickets, call (773) 281.8463 or click here today!